Clicky Clicky: How has the project been going so far? Are you finding it easier or harder than you anticipated? Any particularly big challenges? Sean Tracy: It's been a lot of fun! Definitely a positive experience so far, but I would say that I'm finding it a bit harder than I anticipated, mostly because I'm now at the point where I'm having to scale down what I wanted to do initially. I'd say that's the biggest challenge, having to sacrifice some tracking/production for the sake of finishing it. I've also had some basic technical issues... a broken microphone, broken headphones, etc. CC: Tell us about your recording equipment setup. Are there specific reasons you use the equipment and software that you do? ST: The primary things I've been using to record have been my MacBook and my new USB interface, a Focusrite Scarlett 2i2. It acts as a preamp for a microphone as well as for the guitar, so I've been relying on that for almost everything. I have a microphone that I "liberated" from work that is apparently broken, so I'm most likely (really, really soon) going to borrow or buy another one. For software, I've been using Logic to record/mix and Adobe Audition for more mixing. I use Logic mostly because I learned how to record with Garageband, which is basically Logic's baby brother, so when I wanted something better, it was sort of an easy transition. When it did work, I would kinda dangle it over my amp (a Fender Hot Rod Deluxe) to record the guitar because I don't have one of those little mic stands. The original game plan was to use the Focusrite to record one track of DI guitar, and one mic'ed track off my amp to give it a real amp tone with the DI mixed in. Because of the microphone situation, I'm going to probably just use only the DI tracks. This might change if I get the time to try out another microphone, but I'm not really sure yet. For effects, I have a few pedals that I run my guitar through. 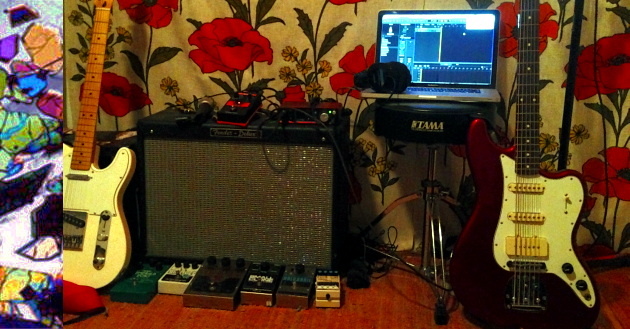 Reverb, chorus, delay, echo, fuzz and distortion so far. I also use Logic to add in some digital reverb and compression to the whole mix. If time weren't a factor, I would probably still do it this way. I think it works really well, especially as a way to dirty up some of the DI tracks. This is my first time recording this way, but I got the idea from Ryan Stack at Format Audio, our recording engineer for the new Chandeliers LP. This is more or less what he did for the bass tracks on the album, and I thought it sounded great, so I wanted to try it out for this project. ST: I guess the one strange thing about me is that I like recording vocals in my car. I get much less background noise/hum that way, and I also don't have to worry about my neighbors thinking I'm a total weirdo/jerk for singing the same part over and over again. ST: For guitars, I've been using a Fender Telecaster, and, in some places, an Epiphone SG. The Telecaster has been the main guitar, but I've used the SG in a couple places to get a kinda crunchier/hotter sound. For bass, I've been using a Fender Bass VI, an instrument that tends to confuse a lot of people because it has 6 strings. It looks like a baritone guitar, which is what most people think it is, but it's tuned the same as a standard guitar and can be played like a bass or guitar (Robert Smith of the Cure was known to use one). I love how it sounds. For the drums, I've been using Logic to program beats. I've been mostly trying to get the programmed drums to approximate the sound/feel of a natural drum kit/live drummer, but in some spots I wanted the beat to feel more like a drum machine. The only other instrument that I may try to use is an old Casiotone keyboard that I have. I think it could be fun to somehow work keys into a couple places. ST: Yes. Well, somewhat. I usually record while I write but that's kind of what I need to do for this project. It's nice to come up with a mostly-structured song before I record it, but with the time limit, I've been finding myself myself just hitting "record" and experimenting until I find an idea I like, and then going from there. ST: Hard to say. I'd like to think that maybe they would be a little more developed, at least structurally, but I don't know if that would be a good thing or not. Were it not for the time limit, however, I don't think that some of these songs would ever have existed, because it's something that's forcing me to sit down and produce something, and hopefully that's caused me to create something a little different or interesting than I ordinarily would have. CC: At this point, do you find the time restrictions to be a hindering your process? Or do you find them to be liberating in some way? ST: I think of it as more liberating. I tend to work well under pressure... sometimes it's the only way I can actually finish anything. I tend to doubt myself a lot, and there's not really time for that. Knowing there's a deadline is kind of motivating me to be creative, but at the same time, there's not a minimum amount of songs that I have to turn over, so it's almost like taking a quiz that you've written for yourself. You know you're the one who made up the questions in the first place, but you still have to think about the answers.